The Swedish FireKnife is a collaboration between Light My Fire and Mora of Sweden, and we could hardly have picked a better partner. Mora has made top-notch knives for 120 years. 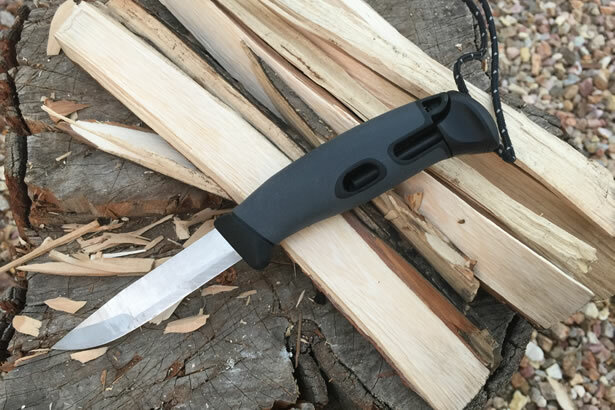 When you research affordable, high-quality, and lightweight bushcraft blades for backpacking and other survival situations, Mora knives are always found high-up on the list. Mora knives have been crafted from high-quality steel in Östnor, Mora, Sweden for more than 120 years and the local craftsmen have continued to pass down their skills from generation to generation. Light My Fire has collaborated with Mora of Sweden to produce a top-notch knife based on the Mora Companion called the Swedish FireKnife. The Swedish FireKnife incorporates Light My Fire’s popular Swedish FireSteel, a magnesium fire-starter that was originally developed and used by the Swedish Army into the high-friction rubber handle. A perfect marriage for a quality survival knife. When I opened up my first FireKnife, I was thrilled at how light it was. The combined weight of the knife, sheath and FireSteel is only 3.9 oz. When you are putting together a pack where every ounce and cubic inch count, its small stature and light weight really make a difference. The Polypropylene sheath feels extremely durable and lightweight There is a small hole located at the bottom of the sheath so any moisture can drain out and a belt clip on its back-side. The belt clip will fit most belts and straps up to 1-3/4″ wide, securely locking it in place. The handle is made from a high-friction rubber with a TPE rubberized grip. The handle’s shape and palm-swell are perfect for medium to large hands. The FireKnife’s partial-tang blade is made from a stainless steel alloy that is both tough and flexible, with a modified Scandinavian grind with an extremely sharp edge. The spine of the blade has a flat profile ground to work perfectly with the Swedish FireSteel. The Swedish FireSteel is a small Ferro rod and a paracord lanyard attached to the end of the FireSteel that can be wrapped around inside the belt loop clip for additional retention. The Swedish FireKnife is made from a very high-quality Sandvik 12C27 stainless steel alloy with a high hardness, great corrosion resistance and outstanding edge retention properties making it both tough and easy to sharpen. It has a modified Scandinavian grind with a brushed finish, an extra bevel mirrored on each side near the tip and has been factory sharpened to a very fine edge. While this blade is mostly corrosion resistant, it is still wise to provide proper care and maintenance. If the blade becomes wet, dry it off thoroughly and lightly coat it with some oil like Break-Free CLP before putting it away. If you do, it could last you a lifetime. 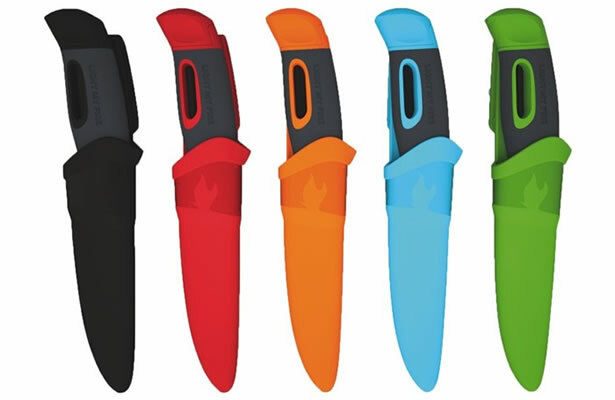 The FireKnife’s handle is made from a molded high-friction rubber with a Thermoplastic Elastomer (TPE) rubberized grip similar in size and shape to Mora’s Companion providing an ergonomic non-slip grip, even in the wettest of conditions. The handle’s shape and palm-swell fit a medium to large hand perfectly. My only complaint with the handle are the holes cut out of each side exposing the FireSteel. I am not sure of the purpose for these holes, but to me they do negatively impact its comfort when used without gloves for a long period of time. The Polypropylene sheath is extremely durable and very lightweight at only weighs 1.1 oz. The sheath provides unfettered access with no straps to unbutton or remove. This is accomplished by its tight fit. When inserting the knife into the sheath, it snaps firmly into place with an audible “click” so you know it’s securely locked down. The sheath has a small hole located at its base so any moisture left on the blade can easily drain out. There is also a durable one-piece belt clip molded onto its back-side that will fit most belts and straps up to 1-3/4″ wide including the MOLLE and PALS systems making it adaptable to most tactical gear, bags and packs available. The Swedish FireSteel is a small Ferro rod approximately 1-5/8″ long and 1/4″ in diameter that fits snuggly into the handle. It is capable of creating a 5,400°F (2,980°C) spark that works equally well wet or dry conditions, perfect for lighting campfires, stoves, and barbecues. The FireKnife has a flat-ground spine perfect for striking against the FireSteel. The Ferro rod should be good for as many as 3000 strikes. However, replacement FireSteels can be purchased directly from Light My Fire if they are lost or become worn out. To remove the FireSteel from the handle, simply grasp the end cap and twist clockwise about an 1/8 of a turn, then pull it straight back. It has a fairly snug lock when new, though it will likely loosen over time. To put it back, just reverse the steps. Once the FireSteel has been locked securely into place, it is not very likely that it will unlock itself and fall out. There is also a paracord lanyard attached to the end of the FireSteel that can be wrapped around inside the belt loop clip for additional retention possibilities. To test the performance of the FireKnife and provide a some sort of apples-to-apples comparison between blades, I conducted four durability tests; Batoning, Feather Stick, Tip Strength and Edge Retention. Additionally, I will perform a Fire Starting test to test the FireSteel. In a survival situation, all resources are fair game. However, since I am not in a life-or-death situation, I’ll stick to some seasoned wood that I have lying around for these tests. Per Wikipedia: Batoning is the technique of cutting or splitting wood by using a baton-sized stick or mallet to repeatedly strike the spine of a sturdy knife, chisel or blade in order to drive it through wood. The batoning method can be used to make kindling or desired forms such as boards, slats or notches. The practice is most useful for obtaining dry wood from the inside of logs for the purpose of fire making. Since the FireKnife has such a short blade and not a full-tang, I decided to hold back on this test based on others that I have done in the past. Since the FireKnife’s blade is only 3.75″ long, I obviously needed to scale the size of the material accordingly. I chose to split a log approximately 3″ in diameter and 12″ in length just to see if it could do it. Rather than attacking the log across the center like you might with a longer blade, I sectioned the log around the outer edge, and then across the center once the diameter was reduced by half. Hitting the FireKnife across the spine and handle with the baton did not damage the blade or handle in any way. However, this blade is so short this approach likely wouldn’t work on any logs larger than 4″ in diameter. So if you don’t have something bigger on hand like an axe or machete, you’ll surely need to stick to smaller material. For this test, I found a length of Douglas Fir around 1″ in diameter and about 12″ long. Starting about 3″ from the bottom and began shaving 2-3″ curls all the way around the feather stick, slowly working my way up. The FireKnife was so sharp and easy to wield, it felt a little like I was shaving a stick of butter. As the stick thinned, I was able to cut through the center leaving what can only be described as a feather stick about 4-1/2″ tall pinecone. I had a perfectly feathered stick to start a fire. 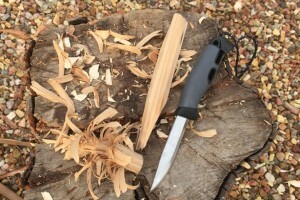 To test the FireKnife’s ability to stab or pierce without bending or breaking the tip, I drove the blade into the end of a 12″ stump as hard as I could. Then I loosened the blade using an side-to-side motion until it became loose enough to pull out. I repeated this action four more times without any sign of damage to the tip. 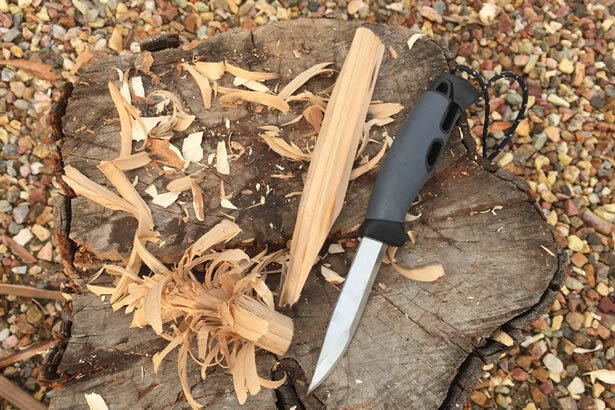 Then I used the FireKnife to bore a hole into the side of a log approximately 1/2″ in diameter and about 1″ deep by twisting the blade back and forth until the hole was deep enough. The FireKnife’s sharp, pointy-tip performed flawlessly. Throughout all of the tests, the FireKnife was able take a licking, yet it held its edge remaining razor-sharp the entire time. After all of the other tests were said and done, the FireKnife was still able to slice through a single sheet of paper with ease. The tests left no sign of cracks, chips or imperfections of any kind. For this final test, I chose to split the test of the FireSteel into two parts. For part one, I used a petroleum jelly infused cottonball. At a distance of approximately 6″, I struck the FireSteel with the spine of the blade tilted at a very slight angle forward. A fair amount of sparks were produced and as expected, the cottonball ignited immediately. Not bad for the first strike. For the second part of the test, I chose to use a pile of wood shavings and sawdust. Again at a distance of approximately 6″, I repeatedly struck the FireSteel with the spine of the blade tilted at a very slight angle forward. With each strike, a fair amount of sparks were produced. After the sixth strike, the were enough embers to get the tinder pile to fully ignite with a little fanning. Had the tinder pile been infused with a resin or other fuel, I am fairly certain that it would have been much easier to ignite. Out of all of the Ferro rods that I’ve used, I was pretty happy with the stream of long-lasting sparks produced by the FireSteel, even with though its only 1-5/8″ long and 1/4″ in diameter. However, I would have preferred it a little longer. The Swedish FireKnife combines an ultra-sharp, high-quality Swedish stainless steel blade with a reliable FireSteel securely attached to the handle, and a tough protective sheath in a small 3.9 ounce package. Its small stature and light weight make it very easy to wield and perform complex bushcraft techniques. Perfect for ultralight backpacking, an Every Day Carry (EDC) or a Bug Out Bag. The FireKnife’s stainless steel blade will remain rust and corrosion free with a little preventative maintenance. Just a little oil right before you pack it away can do wonders to its longevity, even when its stuck in an EDC or BOB for a long period of time. In fact, I liked the FireKnife so much that I had to get one of these for each one of my family’s packs either as a primary or secondary blade. At a little less than $30 each, I think everyone should consider getting one of these for their pack too… And if not a FireKnife, you should at least consider keeping a Mora in your pack. Based in Sweden, Light My Fire specializes in outdoor accessories that are as practical in the city as they are in the wild. From making fires to eating meals – its products have been taken to heart all over the world by both the backyard adventurer and the backwoods survivalist. Sold in 35 countries, Light My Fire products include the FireSteel fire-starter, the MealKit (a re-invented messkit) and the popular success the Spork, which sold over a million copies in its first year on the market. Its latest products are GrandPa‘s FireFork, LunchBox and the SeatPad.